From my house in Nelson, BC Canada, I can see Kokanee Glacier Park and it gives me inspiration for many things. I decided to name these Kokanee Circles after it. My kids love to get involved in making these. Put pecans in a food processor and process until very fine. Add all of the above ingredients to the pecans and process until well blended. Press into a 9” x 13” glass pan and bake at 350F (180C) degrees for 15 minutes. Place the above ingredients into a pot and melt together on medium heat until it starts to boil. Boil for 5 minutes while stirring and then take off burner. Pour this sweet mixture on top of pecan crust and bake again for 20 minutes. 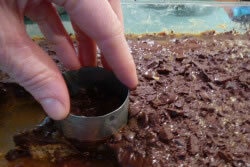 Right when you take it out of oven, sprinkle with: 1 1/2 cups of good bittersweet chocolate chips or cut-up from a bar. Let cool completely and cut into squares or use a cookie cutter and cut out into circles. A winner in our house! These scrumptious cookies are easy to make and absolutely sure to be a hit in anyone's home! Great recipe and will definitely try to make these delicious looking Kokanee circles ! Gosh these look good. Have a great Christmas in Canada, will try these for ours in New Zealand. OMG! These are sooooooo good. And EVERYONE in the family loved them:), that does not happen too often around here. Easy to make and easy to eat. They are a hit it my house hold. Very Tastey...All my favorite ingredients! These cookies are delicious and such an easy to follow recipe. has me dreaming of Kokanee Circles--yummy!